May 7, 2015, 1:49 p.m.
By Justin Ellis @JustinNXT May 7, 2015, 1:49 p.m.
One of the luxuries of modern life is the ability to listen to just about anything you want, anytime, anywhere. And when you carry an infinite jukebox in your pocket or purse, the question becomes: What do I listen to? In the world of public radio, figuring out what you’re in the mood for is not as simple as deciding between the new Sleater-Kinney or the new Kendrick Lamar. This is the challenge NPR One, the customizable streaming app for public radio, is trying to meet. Through intuitive design, listener feedback, and dedicated testing, the team behind NPR One hopes to build a next-generation audio experience for fans and newcomers to interact with public radio. And they’ve got a clear audience in mind for the app: People new to the public radio universe. A survey of users by NPR found that 60 percent of the people listening to NPR One are already public radio listeners. Now that the app has been available to the public for 10 months, NPR is beginning to get back useful data on how people use NPR One, providing information on how people listen, what they’re interested in, and how they make space for audio during their day. “We have never been able on the radio before to have information about how the audience is actually listening to our stories,” said Sara Sarasohn, the editorial lead for NPR One. Digital audio means you can apply the real-time measurements of the web to find out more about your listenership, rather than relying on surveys or Nielsen numbers, she said. What makes NPR One unique is that its programming (or the “flow,” as staff refer to it) is created through a mix of machine learning and human intervention. What that sounds like is typically a collection of stories from NPR’s signature programs like Morning Edition and All Things Considered — but increasingly that also includes local segments from member stations and podcast episodes. 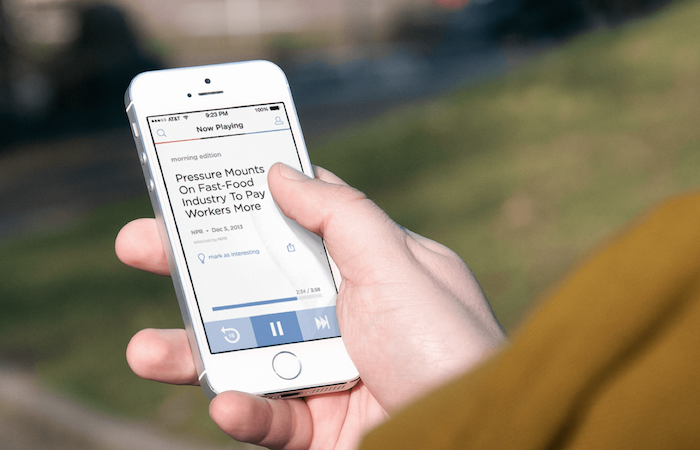 NPR declined to share user numbers for NPR One, but spokeswoman Isabel Lara said the average listening time per session in the app is about 30 minutes. 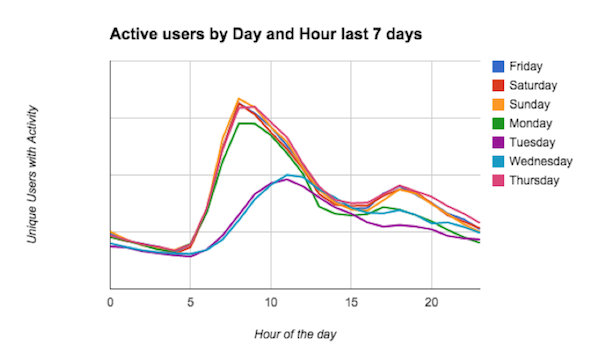 The data shows that for most days of the week, the number of active users peaks during the morning commute, between 6 and 9 a.m., and drops before spiking again around 4 p.m., in time for the trip back home. Another interesting data point: The most preferred method of playback for listeners is the speakers on their phone, closely followed by headphones. Sarasohn said they closely study what they call “skip zones” — the points at which people decide to drop out of a story. According to their research, most skips happen under the first 30 seconds in a piece. But the numbers are only a starting point for improving the listener experience, Sarasohn said. It’s also important to look at what they were listening to and what time of day. Promos — basically brief commercials for other public radio shows with a message from the host — are a relatively new feature for the app. What makes them different is that NPR One lets readers jump right to the show; if you like what Guy Raz is telling you about the TED Radio Hour, you can start an episode with just one tap. 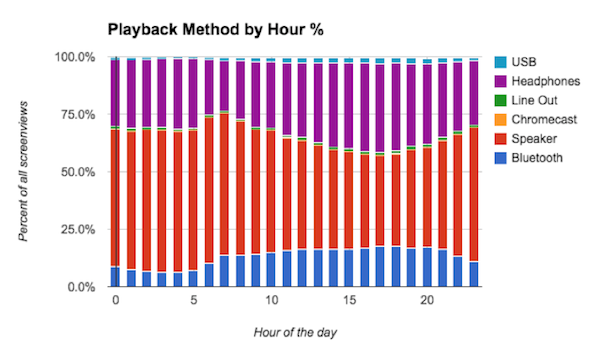 Looking at skips versus tap-throughs uncovered something interesting: Users tended to skip podcast promos earlier in the day, but were more receptive to listening to them — shows like Planet Money or Pop Culture Happy Hour — later in their day. Deciphering what users want is important in perfecting an audio stream that both seems to know what kinds of stories and shows you like but is also still capable of surprising you with something new, Sarasohn said. There’s a level of nuance that might lead to skipping or liking a story — anything from disinterest to the time of day or the fact that you’ve heard a story before, Pennycook said. That’s one of the reasons NPR One blends machine learning with editorial insight to program the app, he said. The algorithms they use to seed the app with stories work well in delivering recency and relevancy, but not things like timeliness, Sarasohn said. For instance, a story on, say, Marco Rubio launching his presidential campaign, has a short shelf life compared to a piece that looks at how Republicans are positioning themselves for the 2016 race. This is where producers and editors come into play, introducing serendipity and an editor’s prerogative. This also allows them to test what types of formats or pieces work best within the app. Sarasohn said they plan to test different types of programming for morning, afternoons, and weekends. “What I want to give people is not just the thing they will tolerate enough that they won’t skip it — but the thing they love,” she said. Finding that balance requires a mix of editorial decisions and intuitive design. Pennycook said the app has to meet the needs of users while also giving a sense of the breadth of offerings from public radio. Today the app has a fairly simple interface — buttons to play, skip, and rewind 15 seconds. Swiping left brings up your listening history, while swiping right offers a preview of what’s next. Getting to that was not easy, Pennycook said, specifically because they wanted ways to infer how people use the app while not making it so busy that they’d abandon it. “People will ask for things that may ruin the thing they like. So you have to correct for that,” he said. NPR One was born out of the Infinite Player, but it also found inspiration from a number of places. 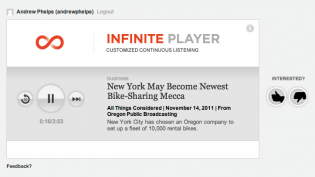 Pennycook says they looked for ideas everywhere, places like Circa, AJ+, Overcast, Stitcher, and WNYC’s Discover app. The ideal experience, Pennycook said, is for people to simply turn on the app and let it run. One problem with that idea is the context or scenario users find themselves in. 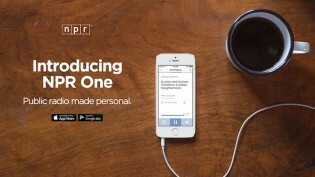 NPR One is available on phones, desktop, Chromecast, Apple Watch, and some connected cars. The way a listener interacts with each is different, with cars and Chrome emphasizing less interaction (cutting down on the distraction while driving or paying attention to your TV) than the other platforms. The next big challenge: unlocking donations and membership opportunities within the app. Pennycook said the idea is to slowly ease people into that pipeline, first by prompting them to designate a local station, and on their second session in the app to register. While the app does offer users a how-to-donate button, all it does is send an email with a link to give to your local station. “There’s tremendous potential, whether it’s existing public radio audiences or new audiences, to drive donations and ultimately, hopefully, membership through NPR One,” said Bob Kempf, vice president and general manager of NPR Digital Services. But right now that potential is mostly untapped, and Kempf admits the in-app donation process is “a little clumsy.” One issue they need to address is how to better differentiate new listeners from people who may already be members of their local NPR station. That relationship is a potential sore spot in the NPR family because the app could bypass member stations to deliver stories and shows directly to listeners. As part of the launch of NPR One, they created a group called the Digital Engagement Council, a collection of member stations that examines the data from NPR One with a focus on improving membership, marketing, and financial support. Kempf said the council was created to help NPR One give users a local, offline connection with the station in their area. One option may be to offer different types of promo cards to non-members, replacing the marketing spots for podcasts or member stations with messaging specifically targeted for new listeners. Stations can use a dashboard created by Digital Services to customize that information, Kempf said. The next step is A/B testing different types of donation options. Some stations will give users an option to directly fill out information to donate to their local station, while others will still have the email to donate button. Kempf said they know the single biggest thing they can do to create better relationships with users — and potential new members — is reduce the friction between giving people what they want, whether that’s listening to their favorite show or the chance to support it. “It’s something we aspire to do, but it’s going to be a while before we get there,” Kempf said. POSTED May 7, 2015, 1:49 p.m.
Ellis, Justin. "Deciphering what the next generation of public radio listeners wants through NPR One." Nieman Journalism Lab. Nieman Foundation for Journalism at Harvard, 7 May. 2015. Web. 20 Apr. 2019. Ellis, Justin. "Deciphering what the next generation of public radio listeners wants through NPR One." Nieman Journalism Lab. Last modified May 7, 2015. Accessed April 20, 2019. https://www.niemanlab.org/2015/05/deciphering-what-the-next-generation-of-public-radio-listeners-wants-through-npr-one/.